Due to the passing of my husband, Jake Richter, from cancer in June of this year, I did not have the time and energy to do much painting and therefore do not have any new artworks to share. I contemplated creating a 2013 calendar using oldies-but-goodies, but time literally got away from me and I find it is mid-November with nothing to show for it. Those on my Christmas card list will find one small creation using four of Jake’s food images – no more hints than that, although I will post the image when Christmas is nigh. I have started painting again with my return to our home on Bonaire. I have four canvases in the works – yellow orioles, a gnarled Divi Divi tree, a beach vista and red macaw portrait. I hope to reopen my in-home art gallery by the beginning of December. I’ve got another two on the drawing board, but not quite started with flying flamingos and some luscious purple calla lilies. In a quest for the perfect name, I did some research about conch and sea shells in general. One phrase struck a cord – prismatic layers. Basically a shell is calcium carbonate which brings to mind a white gray chalky looking mineral supplement, or maybe the white skeletons of long dead corals washed up on the beach. 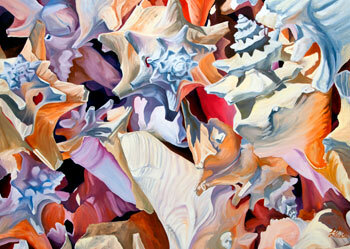 “Prismatic layers” aptly describes the hues of my Queen Conch shells. Traditional oil paintings are painted in layers, as such; I usually have several paintings in various stages from blank canvas to the finishing touch. In the studio now I have a glorious peacock, a pair of macaws, a flamingo in a tide pool, a pile of conch shells, and even a triptych view from the beach.